Once a backup job is complete, the Syncrify client can send email to the user containing a list of files that were modified. This email is sent only when you run backup from console or through scheduler. Email is not sent when running backups manually. By default, emails are generated regardless of the results even if there are no errors. Although many users may like getting emails regardless of their status, some may prefer getting it only if an error occurs during backup. 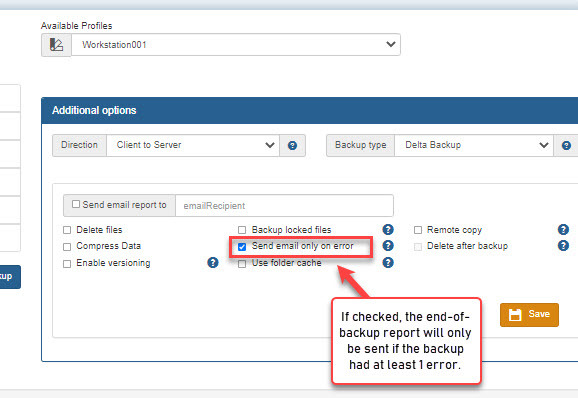 The check box in the image above does exactly that: Syncrify will only generate email if one or more errors occur during backup. NOTE: An important piece of information to keep in mind is that Syncrify client never sends email to SMTP server. Instead, it prepares the email body and sends it to Syncrify server, which then contacts the configured SMTP server. Therefore, it is important that you correctly configure the SMTP settings in Syncrify server.